I am by no means exaggerating when I say I have been living in this velvet puffer jacket over the past few weeks. Outerwear has been given a revamp this season and it's safe to say the puffer jacket is everywhere for Autumn/Winter. At first I was a bit hesitant to embrace the trend but I couldn't be happier that I did. There's nothing wrong with taking it back to the 90's, after all this was the era of Britney, The Spice Girls and lets not forget The Nintendo or the Tamagotchi. Just writing that down makes me feel ancient. You may have seen in my previous post that I styled this very puffer jacket with a red sequin dress as means of dressing my party look down. For the purpose of today's post I have thrown it on with a pair of jeans and roll neck jumper which is exactly the sort of thing I would wear everyday. 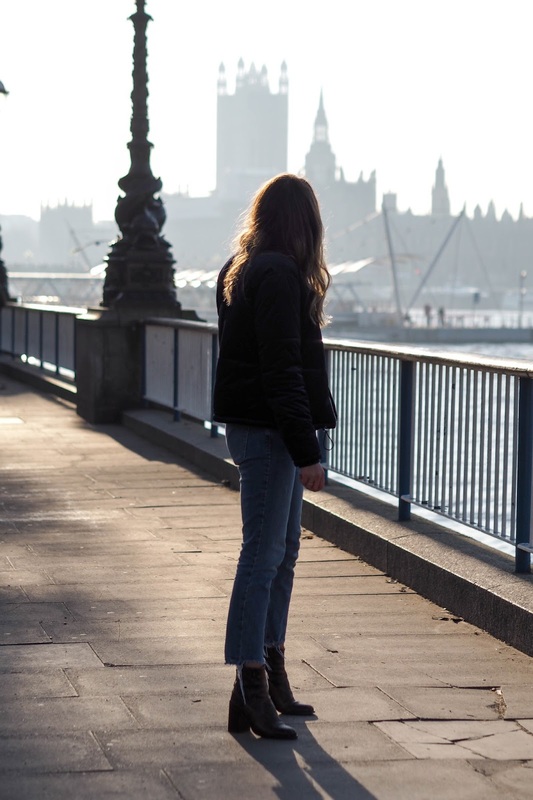 Something that is practical for running around London but also warm. When I tell you this puffer jacket is warm, it really is which is perfect for me as I tend to feel the cold a lot. I actually wore just a t-shirt underneath and was surprised at just how snug it kept me. Winner, winner, chicken dinner if you ask me. I'm sorry to go on but I really don't think these photos do this velvet puffer jacket the justice it truly deserves. I think one of the main reasons I have really fallen in love with this puffer jacket is mainly due to the amazing velvet texture. 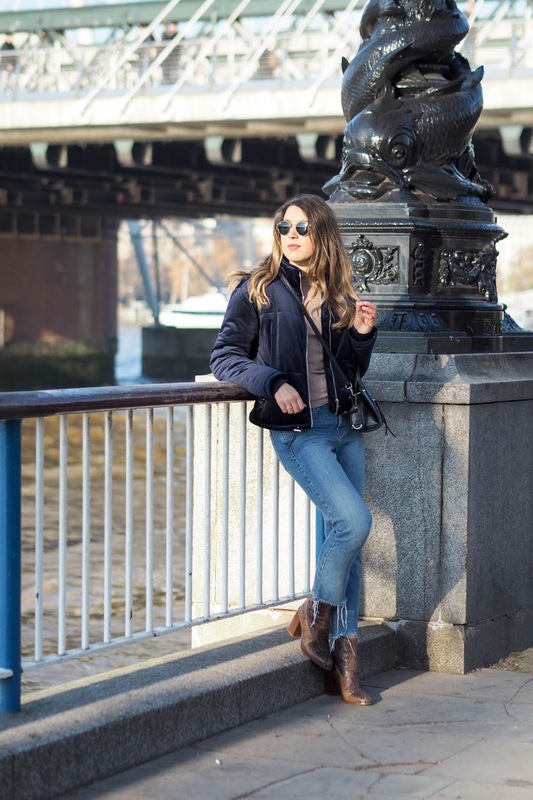 As another key trend for this season, velvet is literally everywhere this winter but with that said, it can often be difficult to incorporate into your everyday style. Not this baby. From party dresses to pleated midi skirts the styling options are endless and the luxe fabric gives it a modern finish. Needless to say I really have had so many compliments on it for the short time it's been in my life. One girl even ran after me at the train station to ask not only where it was from but also how much it was. Admittedly, a little startled but I admired the dedication that's for sure. I could have teamed this outfit with a pair of trainers for ultimate comfort. 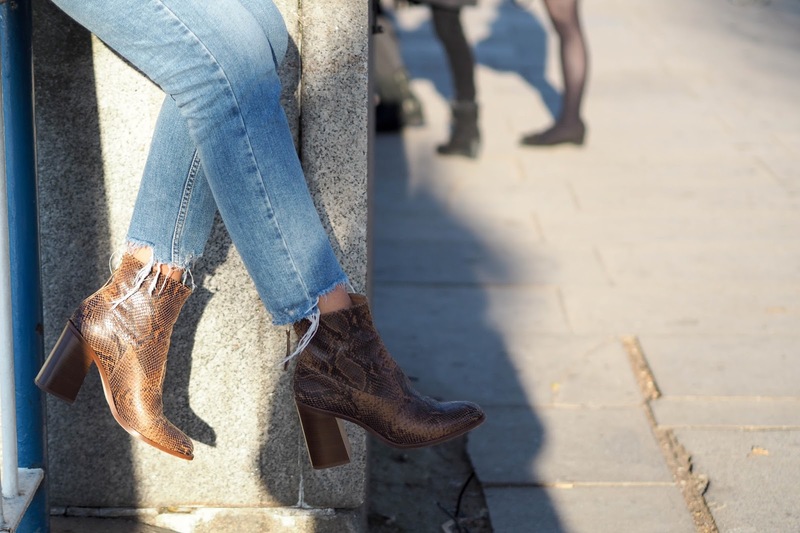 Lets face it my navy adidas gazelles would look perfect but I opted for a heeled ankle boot because it's so easy to instantly dress an outfit up this way. 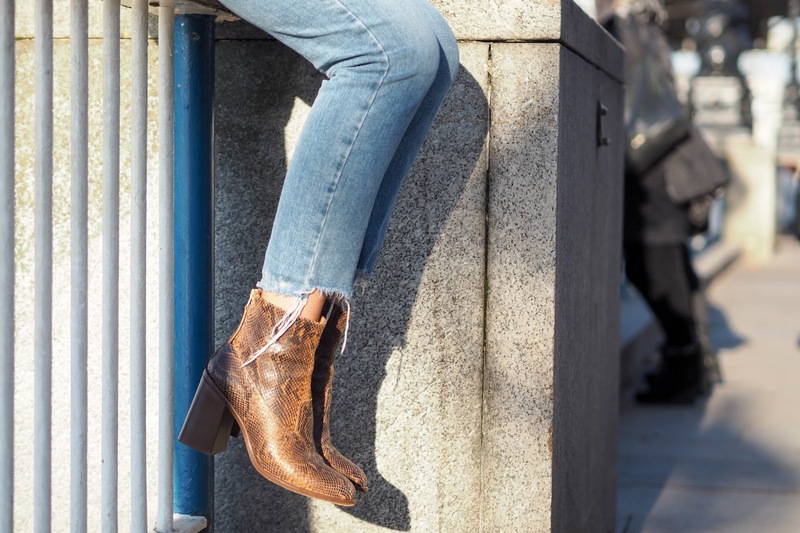 Not to mention that the snakeskin texture on these boots is amazing and a nice touch to the frayed edge detailing on these straight leg jeans. Have you added a puffer jacket to your outerwear collection this season? If so I would love to know how you incorporate it into your everyday style. love this look! 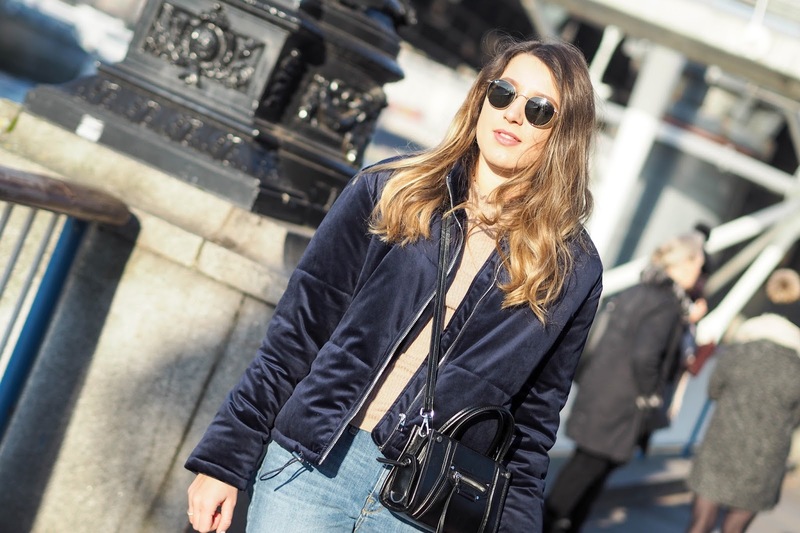 I've been absolutely loving the velvet trend, this is such a perfect way to channel the trend into outerwear. Also really loving those jeans!